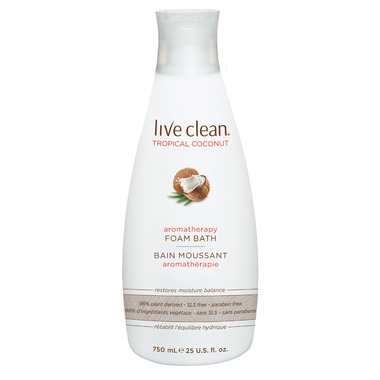 Live Clean Aromatherapy Foam Baths are packed with plant derived moisturizers and infused with vitamins and antioxidants. Featuring certified organic Chamomile, Ylang Ylang, and Jasmin, scents rich in aromatherapy properties to create a calming, sensory escape. Natural Tropical blends of certified organic Coconut and Citrus botanicals provide a full body ultra-moisturizing escape, rich in vitamin E to help moisturize dry skin. Makes decent bubbles. Smells nice, but it's very subtle once you're in bath.